Sulmona has ancient origin lost in the legend: in fact it would have been founded from Solimo, companion of Enea, fugitive from destroyed Troy. First testimonies of its real existence are however of roman age. But the city marks one fundamental stage in 43 b.C., year of birth of its most famous citizen, eminent Latin poet Publio Ovidio Nasone, singer of the Amores and the Metamorphoses. Of the roman period it remain the spot where the temple dedicated to Ercole Curino rose. Later the city knew the common history of the localities of central Italy: barbaric invasions, repeated devastations and pillages. Only with the advent of the Svevi and Federico II, Sulmona developed assuming a main political role in the Svevo Empire. But the fall of the Svevi and the arrival of the Angioini coincided with a period of depression for the city. At the end of the '200 Sulmona and the Eremo di Sant'Onofrio gave shelter to the only outgoing Pope of the history: Celestino V, the “Pope of the great refusal…” cited by Dante in the Divina Commedia. 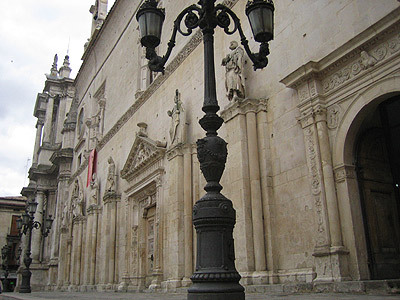 A visit to Sulmona can start from one of its ancient doors, of which one of roman age: Porta Romana; continuing towards the churches of Saint Filippo Neri ('300) and Saint Maria della Tomba in the Plebiscito square, built on a previous roman building. The city also owns precious historical palaces: Palazzo Tabassi, Palace Sardi, Palace Sanità, Palazzo Sardi and Palazzo Meliorati. 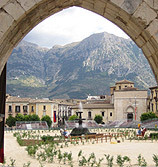 In Sulmona takes place in August the Giostra Cavalleresca, that attracts numerous tourists in the city.